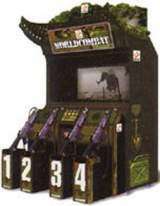 World Combat © 2002 Konami Corp.
A 1- to 2-player military combat shooting game. Using optical guns, players must attack, kill and destroy enemies while fighting in each battle in the war to complete each mission. Players can shoot weapon icon to upgrade their own weapons and press the start button to select a weapon. Every time a mission is completed, players get a rank promotion. Released in December 2002 in Japan. This game is also known as "Warzaid".